Even people who don’t like parsnips or sweet potatoes usually love them in this dish. 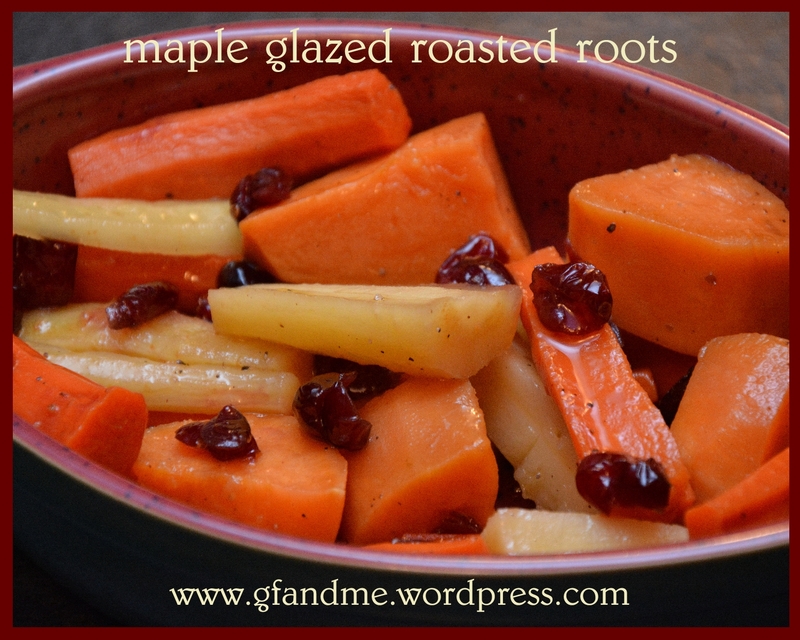 The maple glaze is subtle, adding just a hint of sweetness to the individual vegetables. Personally, I like eating these roots cold for lunch the next day! TIP: Brown sugar works as well, but keep an eye on it as it can start to burn. Place vegetable pieces in 9 x 13 pan. Sprinkle with salt and pepper and drizzle with oil. Toss to coat well. Drizzle with maple syrup (or coat with brown sugar) and place pan in oven. Bake for 35 to 45 minutes, tossing every 10 to 15 minutes, until softened and just turning brown. Place on server and sprinkle with craisins. TIP: If you like your vegetables caramelized, roast in a 450 degree oven. This entry was posted in Lunch and Dinner, Recipes and tagged brussels sprouts, carrots, celiac, Christmas, GF, gluten free, parsnips, sweet potatoes, thanksgiving, vegetables. Bookmark the permalink. PS–the background wallpaper of your blog looks great. Thanks for noticing! It’s one of my favorite paintings: Hunters in the Snow by Pieter Bruegel the Elder (1565). I really like how its both dark and cold and yet somehow full of life, light, and hope. I love root veggies – always looking for new ways to prepare them so I can get my family to eat them! Thanks for sharing something so tasty. They are (or should I say ‘were’) good! Mmm parsnips are my favourite – this is a great recipe! Oh I wish I would have had this recipe before Christmas. My sister-in-law asked me to bring glazed carrots to dinner and I had no idea what they were. I am not a fan of cooked carrots as I think they are too sweet. So I had never made them. This would have been fantastic to bring . . . .maybe next year when she asks I will be prepared now. This looks delicious! I will have to try it soon.